50%, 89%, and 50%, 50%, 25% and 16% gains already on 5 of our first 12 trades in the first 9 weeks! With a $5,000 E-MINI Futures position, you can profit with defined risk and reasonable exposure! With the volatility now picking up in the US markets across the board, you need a game plan to profit and protect capital both! 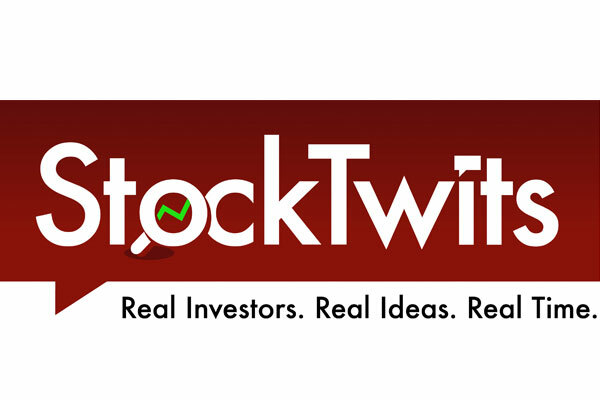 We were flattered to be one of only 25 active members on Stocktwits.com out of 3 million registered users asked to have a Premium Service. Over 59,000 traders follow us on the platform. We have subscribers to our main services in 44 countries! Our SP 500 market models and forecasts are well known by investors and our subscribers to our various services. We are now taking these accurate short to intermediate term forecast models and putting out actual SP 500 Futures trades to Premium Room members on a regular basis. In a down market or Bear Cycle which we are likely in now, you can profit on counter-trend rallies as well as the ensuing Bear declines. The gains can be stunning in short order and the risk is always measured as well. A recent trade returned 50% within less than 24 hours of market window. We projected a larger degree rally to 2822 area from the 2626 futures lows on November 29th. 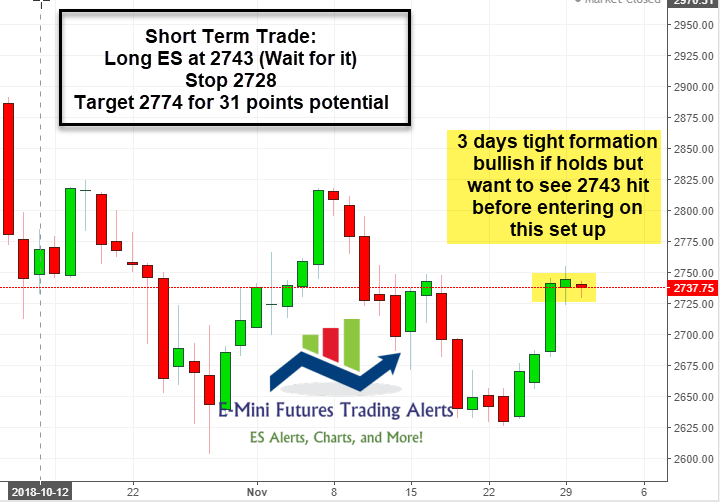 We waited for the opportunity to grab a piece of that rally and we entered the Futures Trade long on November 30th at 2743, a Friday afternoon. On Sunday, we closed the trade at 2793 as the market gapped up for 50 points or 50%. 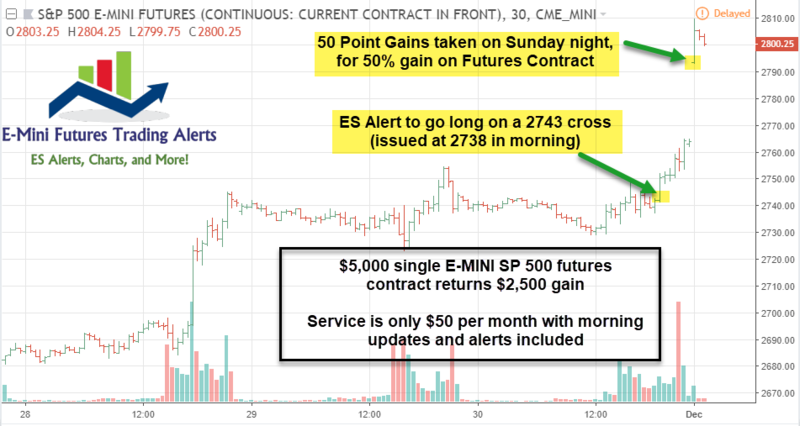 A $5,000 E-MINI Futures Contract returned 50%, or $2,500. We had two other massively profitable trades since the late October launch, one returned 89% in 5 days and another 50% within 2 days. These were all actually long or bullish trades during the market correction but going with reaction bear market rallies to make profits! Here was our November 29th chart forecast sent to Premium Room Members on Stocktwits.com and then our trade thereafter. Here was our Trade Set Up chart sent to members on Friday, November 30th. We said to wait for 2743 to hit, then go long at 2743 with a 2774 target to take profits. The market rallied straight up after hitting our 2743 buy point, then closed at 2764. We held the long position, and on Sunday when the Futures market opened at 2793, we sold for 50% gain. The ES hit 2813 and then a few trading days later was back down to 2700. We locked in gains on the run up! 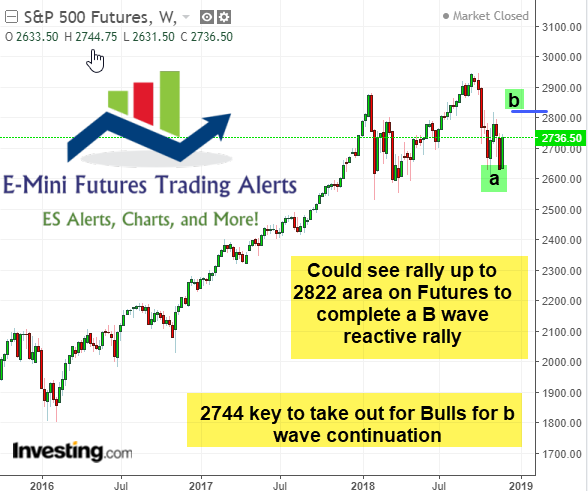 Our Elliott Wave Based market forecast models incorporate several additional indicators, most behavioral based to help our Traders in the service profit from the big moves. With the market possibly in a new Bear Cycle, you need all the ammunition you can muster to remain profitable no matter the short or intermediate term paths. Our track record through 12/31/2018 is 12 trades, 7 closed for losses , 5 for gains. Net profits so far of 145% or 145 Futures Points! For $50 a month, you can join our SP 500 Futures trading room and get our morning chart updates, market commentary and actual Buy and Sell alerts delivered in real time via IOS application and Email and also in the room itself. A $5,000 contract is the minimum dollar amount for an E-MINI futures trade. Each trade alerts you to the buy price, the profit target, and the stop loss in advance. All you do is enter those parameters in your Interactive Brokers or other Futures Trading account and let the rest take care of itself.